Intertronics has issued a new brochure focused on its ISO 10993 and USP Class VI adhesives and protective materials – and associated equipment – for medical device assembly. This, according to the company, indicates its commitment to helping companies in the sector to achieve vital process reliability, repeatability and validation. 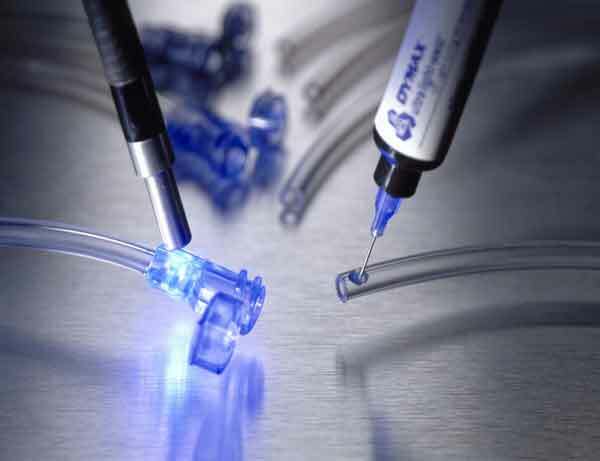 Products covered include DYMAX medical grade adhesives, coatings and masking materials, Opti-tec epoxy adhesives, medical grade cyanoacrylates and the Polytec PT range of two-part adhesives. Intertronics also highlights its range of precision dispensing/dosing equipment, dispensing robots, micro dispensing jetting technology, planetary mixing/degassing systems and the flowplus16 dosing validation sensor. From its long history of working with companies in the medical device sector, Intertronics is familiar with its demanding requirements, including the assurance that validated assembly processes are verifiably and consistently under control. The materials featured in the brochure are typically used in the manufacture of catheters, tube sets, reservoirs, respiratory masks, laryngeal mask airways, resuscitation tubes, blood filters, syringes, needles and oxygenators. The effectiveness of these materials in the assembly process is determined in part by the equipment used to dispense and, in the case of some, cure them. Intertronics’ ethos of specifying and supplying complementary material and equipment technologies can further facilitate efficiency, reliability and repeatability. This includes the latest UV LED technology which can provide a number of benefits over broad spectrum UV curing. The catalogue can be downloaded from www.intertronics.co.uk/medical.